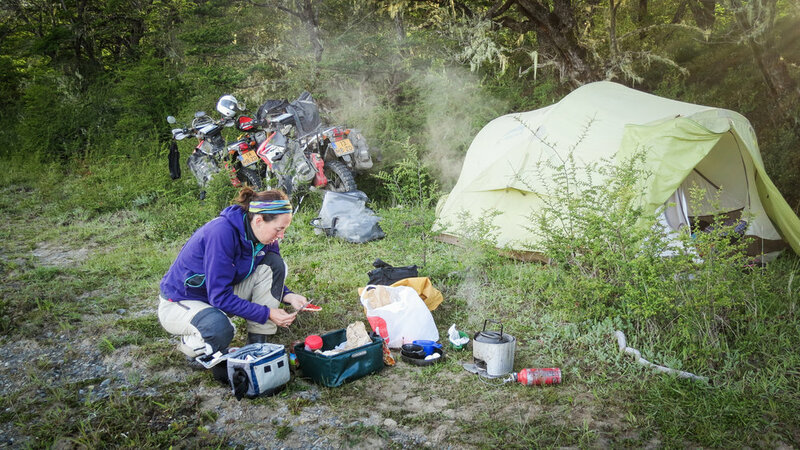 Quitting your job, renting out the house and leaving for a 3-year motorcycle trip around the world: you can probably think of plenty of reasons why it’s impossible for you to do this. We could too. We had good jobs, a nice apartment and thought about having a family. At the same time we shared a feeling of curiosity and a desire to explore the world. Each pro-con list we made had a long list of ‘cons’ but also the words: Now or never! We feared to regret the decision to stay at home and so it happened that day in December 2013 when we got on our motorbikes, waved our family and friends goodbye and left. First destination: Africa! It was wintertime and very cold in Europe when we started. As fast as our little Hondas could take us we rushed to the Mediterranean Sea, away from the snow and into the sun. In Italy we boarded a ferryboat that took us to Tunisia. Until then it had felt like a summer holiday, but once we arrived in Northern Africa this changed. The buzz at the local markets, the smells of the amazing food and the challenge of ordering from an Arabic menu, it was so different from life back home. Plus we now shared the roads with chaotic traffic, donkey carts and the occasional camel. The adventure had truly begun. 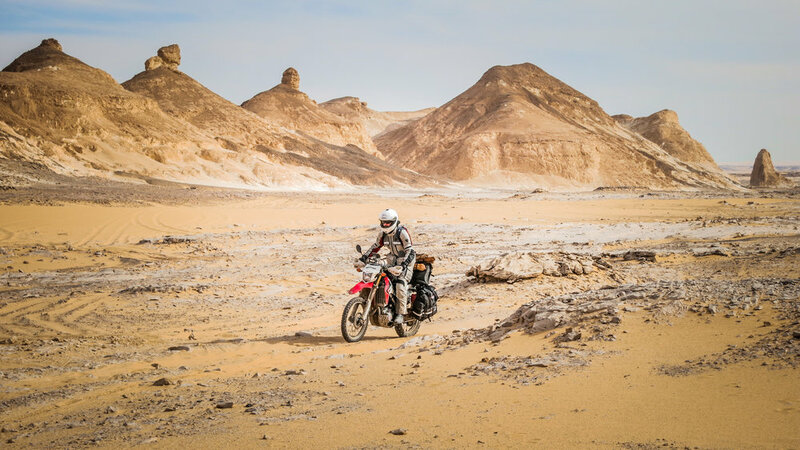 From Tunisia, we turned east to ride through Libya and Egypt to Sudan. In all honesty we had been nervous to take this route, because the news about Northern Africa had not been great and the political situation was quite unstable. Yet this was the only way to get to East Africa, so we were determined to give it a try. And luckily we did, because we could have never expected that riding through Northern Africa would be such a positive experience. From the day we arrived in Libya until the day we left Sudan, we were overwhelmed by the hospitality of the people and the warm welcome we received. Whenever we stopped, people came to offer tea or fruits and it often happened that shop owners wouldn’t take our money. In Libya we only stayed in a hotel once, because all the other nights we were invited into people’s homes. At police checkpoints we were mostly stopped out of curiosity and were always offered tea or water. It was nothing like the stories we had read in the media and we felt so at ease that we fully enjoyed traveling here. We visited ancient sites in Egypt and Sudan and had a great time riding and camping in the desert. It was a great beginning to our trip through Africa. With our 10th border crossing we entered Ethiopia. After Northern Africa, this was like a different world. The people looked different, their culture and religion was different, their language unique and even their food was unlike anything we had ever tasted. Another change was the great number of people. Whenever we stopped it took only seconds before we were surrounded by people. Even in the most remote areas, just when I had found a bush-toilet, someone would pop up right beside me! Our first real offroad adventure was riding along Lake Turkana from Ethiopia into Kenya. 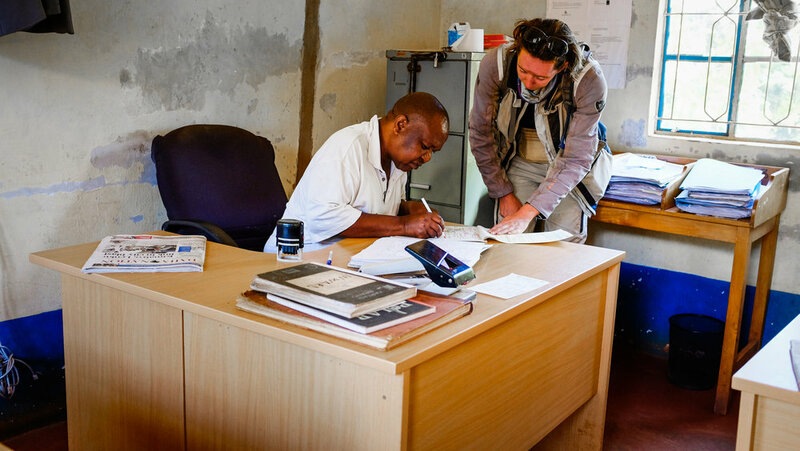 A tough route on Africa’s backcountry trails with long stretches of deep sand, made even more challenging by the heat and the knowledge that the next hospital was far away. For the trip we bought two Honda CRF250L’s and those light bikes were the perfect choice for trails like this. We could really go anywhere without worrying the loaded bikes were too heavy to handle. The route near Lake Turkana passed traditional tribal villages; that was a great experience and the adventure we had been searching for. By the time we entered Kenya we hit the three month mark. Without really noticing it also was the moment we slowed down; riding shorter daily distances and taking more breaks. 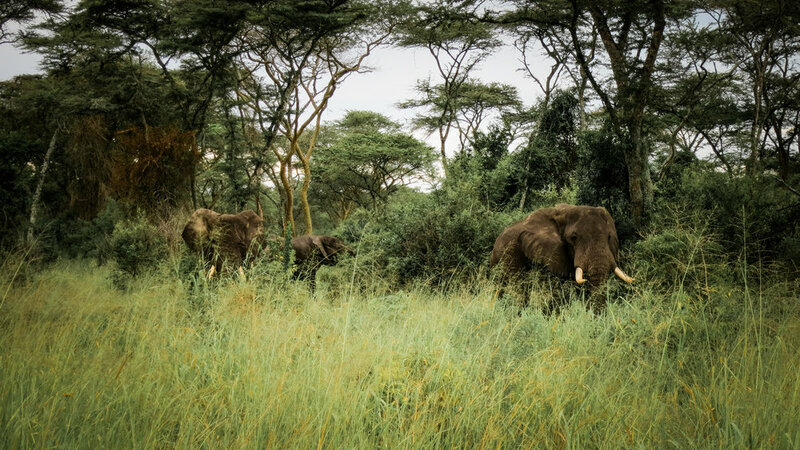 The timing was perfect because East Africa was the best place to see wildlife. 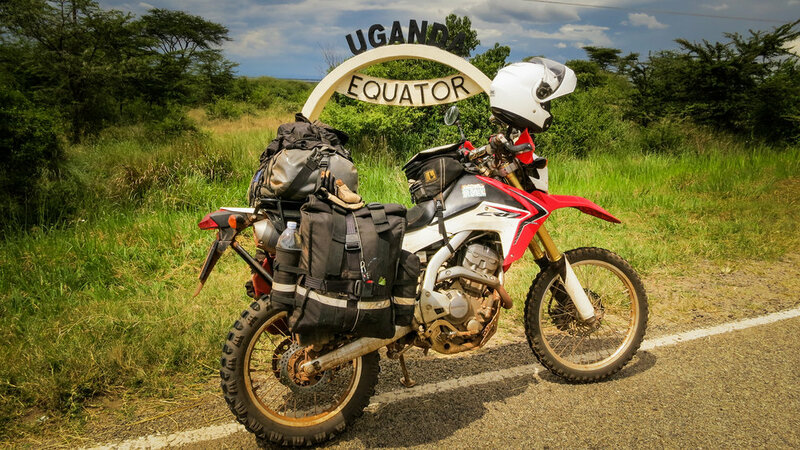 We took our time riding around Kenya and continued to Uganda where we had the opportunity to go on a motorcycle safari, riding among the wildlife on our own bikes. We continued our journey in East Africa through Rwanda, Burundi and Tanzania. Riding days in Africa were almost like Forrest Gump’s box of chocolate, we never knew what we were gonna get. A yellow line on the map could be a very smooth paved road, but also a terrible potholed dirt track. We learned to surrender to this uncertainty and just went with whatever surprise came on our path. We were pleasantly surprised by Africa; traveling there was not as hard or dangerous as we expected. Apart from a monkey who stole our cookies we never had a bad experience. We met a lot of friendly people who were curious about our trip and proud that we visited their country. We zig-zagged through the southern part of Africa to see more wildlife and ride as much spectacular routes as possible. Our bikes carried us through Malawi, Zambia and Zimbabwe to South Africa. Zambia surprised us with great wildlife, a great route near South Luangwa National Park and a visit to the Victoria Falls. In South Africa we rode some of the most beautiful coastal roads in the world to the Southern most point of Africa in Cape Agulhas, where the Indian Ocean meets the Atlantic Ocean. When we arrived in Cape Town we had ridden 16,000 miles. It was time to give the bikes some TLC. We found a nice place to stay and took a break to work on the bikes and enjoy the luxury of living in a home. In South Africa we could get all the parts for our Honda CRF250L we needed. For the first time since we left we changed the tires. They had lasted very long, a big advantage of traveling low speeds on light bikes. After three weeks we had itchy feet and got back on the bikes. It felt great to be riding again, especially now that they were purring like never before with new chains, sprockets and oil. We couldn’t get enough of Africa and were happy to have another top destination waiting for us: Namibia. After Mongolia this is the least populated country in the world. There are hardly any paved roads, but there is a great network of gravel roads and dirt tracks. These tracks, together with breathtaking views and lots of wildlife, made Namibia one of our favorite countries. We rode a big loop through Namibia and Botswana to then return to South Africa. After 11 months in Africa it was time to pack up, so in Johannesburg we crated the bikes and together we flew to Buenos Aires, Argentina. Landing in South America marked the start of a new chapter. In a way it felt like starting all over again. We had felt at home in Africa, we knew our way around and loved it there. Our first weeks in Argentina were not so easy, mainly because we didn’t speak Spanish. In Africa we got a long way with English and French. And if that wasn’t enough, making the right sounds helped to explain we wanted to eat chicken. In Argentina this didn’t work, which made simple things very hard. Luckily we soon found out that the Argentinian people speak one language we do understand: motorbike! They absolutely love motorbikes, which was an easy way to meet new people. The first Spanish we learned was about tires, engine oil and fuel consumption, but we soon picked up enough to order a good Argentinian steak and some tasty wine. With new energy we started exploring South America. 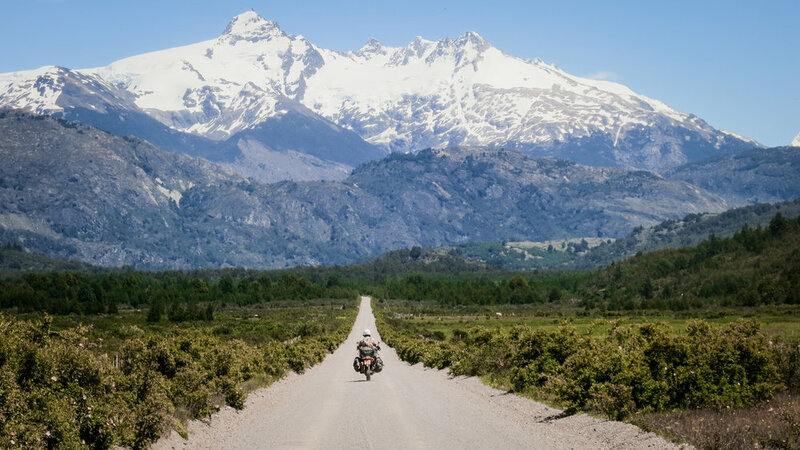 Our first destination was the Carretera Austral, an unpaved road through Chilean Patagonia. The area was spectacular and the ride soon became one of the highlights of our trip. 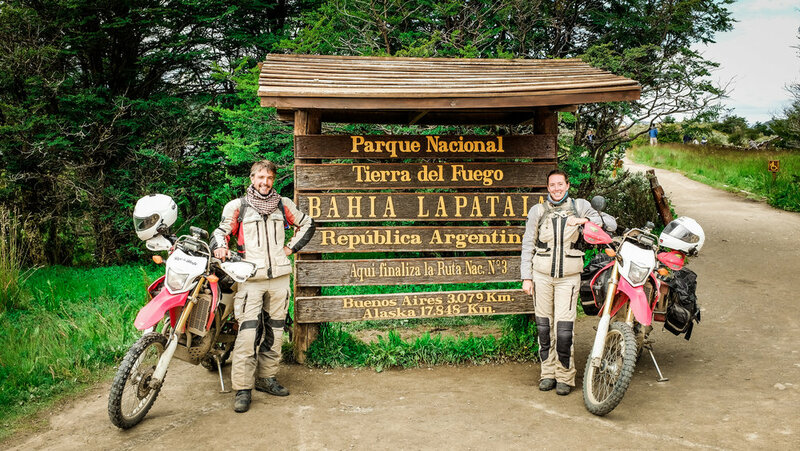 We continued south through Chile and Argentina to reach the Southern most point of our travels in Ushuaia. After reading so many reports of motorcycle travelers who reached this point, we felt so proud to be here. From here, the only way was north! A few days after we left Ushuaia we were stopped by technical problems for the first time. Peter handled all the maintenance of the bikes, from day to day checks to replacing worn parts. We either carried spare parts or were able to get them on the road. This time we weren’t so lucky, because the thin fork oil we needed for our shocks was hard to get in Argentina. We got stuck in El Calafate waiting for the oil. This sounds worse than it was, because we discovered that it’s true what they say: when you’re in trouble, you’ll meet some great people, and we did! Local mechanic Mario opened his garage for us. He spoke ’motorbike’ and helped in any way possible. On top of that El Calafate was a travelers’ hotspot where we met other motorcycle travelers every night, each with their own inspiring stories. Being stuck was not so bad after all. Back on the bikes we continued north following the famous Ruta 40. In the south the road leads over some windy plains that can be boring at times, but further north it takes you through rugged mountains, past small colonial towns and great vineyards. Like in Southern Africa, we zig-zagged through Argentina and Chile, crossing the border and the spectacular Andes Mountains several times. In the north of Chile, surrounded by volcanoes, flamingos and geysers, we prepared for the next offroad adventure: the Lagunas route in Bolivia. You can read all about this route and the second part of our RTW-Trip in Amsterdam to Anywhere Part II which will be published in UpShift Magazine in July. Stay tuned!